William McKinley is shown on the front of all 1902 $10 bills. 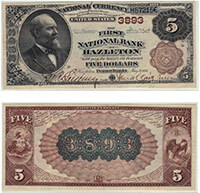 This is the single most common type of large-size national bank note. Some of these are only worth around $50. Some can be worth $500, and others still can sell for more than $5,000. It is all about the bank rarity. Sadly, there is no place online to see if you have a rare bank. The best advice is to just check with an expert. We happily answer questions about all national bank notes. Contact us to get the value of yours. Don't forget to check the serial number. Number 1 notes always sell for nice premiums.